TORONTO — Longtime Toronto Blue Jays radio broadcaster Jerry Howarth will not return to the booth in 2018. Howarth announced his retirement Tuesday after 36 years of calling Blue Jays games. The 71-year-old said he made the decision due to health issues that have affected his voice in recent years. “I had every intention of continuing my career into the 2018 season but my health and stamina and continuing voice issues dictated otherwise,” said Howarth. “Who knew that I would spend more than half my life in Toronto with my wife, Mary, and our two sons, Ben and Joe, doing what I love to do most, reaching out to friends and fans alike across our great country to talk baseball? There was no immediate word on who Howarth's successor would be. Howarth, a native of York, Pa., who was raised in San Francisco, began his broadcast career in 1974 with the Tacoma Twins of the Pacific Coast League. He joined the Blue Jays in 1981 and has called Toronto home ever since, eventually becoming a Canadian citizen. “Jerry is an absolute legend in this industry,” said Scott Moore, president of Sportsnet and NHL Properties. “He’s been a dedicated and consummate professional covering the Blue Jays for more than three decades. In 2012, Howarth was honoured by the Canadian Baseball Hall of Fame with the Jack Graney Award for lifetime contributions to baseball in Canada. He was also awarded the Sports Media Canada award for Achievement in Broadcasting both in 2003, with then broadcast partner Tom Cheek, and again individually in 2016. “He’s been there for every home run, strike out, and flip of the bat that has mattered most to Blue Jays fans,” said Dave Cadeau national format director for sports at Rogers Radio. “He’s as knowledgeable a baseball mind as you can find, and an even better storyteller. Toronto Mayor John Tory also paid tribute to Howarth, praising him both for bringing luck to the team whose games he called and for contributing to the city he came to call home. "He's a very special person and we will miss him," Tory said at a news conference, "but it's most important that he should live many, many more years in good health." Howarth called Toronto's back-to-back World Series victories in 1992 and 1993 with Tom Cheek, who died in 2005 from brain cancer. Howarth worked the Sportsnet 590 The Fan booth last season with Joe Siddall and Mike Wilner. Perhaps best known for his 'There She Goes!' home run call, Howarth has used a steady, warm, conversational style throughout his long career. Starting at spring training each year, Howarth would keep notes in a thick spiral notebook that would be kept close at hand throughout the season. His preparation was meticulous and he would score each game using a shorthand all his own. A man of routine, he would provide consistent refrains while on the air. 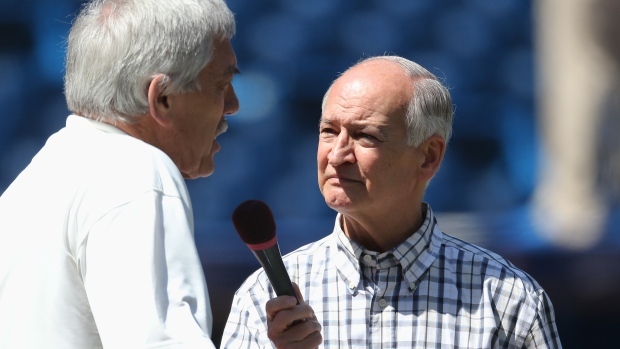 "Hello friends, this is Jerry Howarth and we're live from the Rogers Centre," was the usual pre-game opening for those listening on the flagship station and around the country on The Fan Radio Network. Howarth would weave in stories from his decades in the sport and often used trademark lines like "He scorrrrres" or "The Blue Jays are in flight" as he called the action. In 2016, a small tumour was discovered when Howarth underwent a magnetic resonance imaging scan after learning he had elevated prostate-specific antigen test numbers. The tumour and his prostate gland were removed and doctors declared Howarth cancer-free after the procedure. He returned to the booth in time for the 2017 season but had to miss 21 games after a virus in late April led to laryngitis. There were some online rumblings late in the campaign that Howarth might not be back for the 2018 season. When asked about his future plans in late September, Howarth said in an email that he had no plans to retire, adding he was "in fact looking forward to a healthy and strong 37th year."